R150 per rod per day. Upper dam allows for water craft. Lower dam Catch and Release only. Hot water ablutions. Standard power points. Beautiful views of the dams. 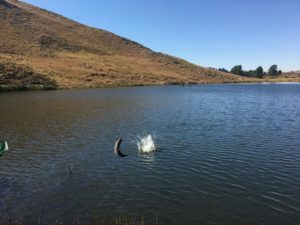 Bongani was trained as a fly fishing tutor many years ago by the DFFA. He has been working on the premises for over 15 years. He offers tuition and any advise regarding this fine sport. For general enquiries regarding your stay in a cottage, group bookings or camping you can call Liesl for assistance. Highest parkrun in the world every Saturday. Music Events and outdoor extreme sports hosting and organizing. Beautiful dam and good accommodation. Tough fishing but great challenge. Amazing place, great scenery, friendly staff. All agreed that the camping was great and we will be back again. Stunning. Hi Liesl, I've been meaning to msg you all week...just to say thanks.. we really enjoyed our stay and the fishing was great! I'm sure we will be back soon.